First thing I need to clarify that a high availability cluster is not a load balanced one. Although both kinds of approaches are not mutually exclusive (you can combine them), their pros and cons are different and the way they work as well. I will write later a comparison between them, for now just remember it is not the same. A high availability cluster deployment needs at least 5 servers. The following picture shows a basic deployment. two PBX servers who are responsible for handling the SIP and RTP flow. These servers have installed FusionPBX, FreeSWITCH, Memcached, the Lua supporting scripts and more stuff. One of these servers is playing an active role, the other is a passive one. Continuity: when a node goes down, the end user will not notice more than a dead air for few seconds. 100% compatible: all phones work with this approach since they do not see the cluster. As for end user's eyes, there is only one server. The passive server may be considered a waste of resources. It will be sitting doing nothing until the active fails. All the servers must be in the same data centre. 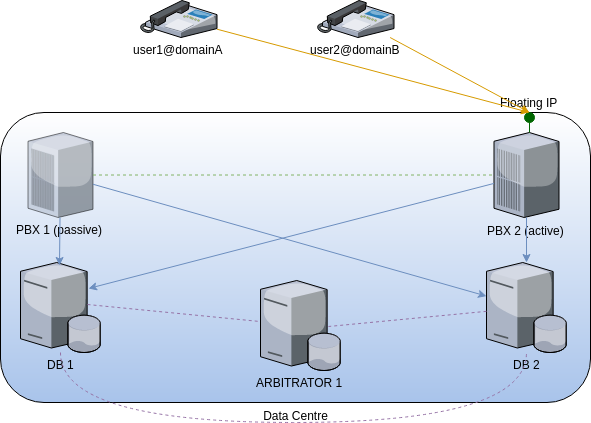 As the floating IP needs to be in the same collision domain, the only way is they share the same network. You may work around this if you have an MPLS network between two data centres; but since this is very expensive, most data centres do no provide MPLS or BGP solutions, therefore if a data centre goes down, you may go down as well. The cheapest fix for this is combining the high availability and load balancing approaches. Your router needs to have off any kind of ARP caching parameter. Some routers do cache to speed things, but in this case, this could do a really big harm as the floating IP technique relies on updating the ARP tables. The endpoints will not make a difference in this case, as for their point of view, they are just connecting to a single IP. The database will replicate the information with the other node. In the very case of a high availability cluster, information flows are almost the same as a stand-alone deployment. The big difference is the database which it is external. Although you may think why not to let the database in the PBX, beside the future performance issues, when the active node goes down, the database will be as well. Depending on the kind of the crash, the database could not recover easily. When a fault tolerance event happens, the endpoints will keep pointing to the same IP. The floating IP technique used in the high availability PBX cluster detects when the active node stops answering and it is here when the passive node takes the floating IP. When the move happens, the now new active server will notify the neighbours it is now the new holder of the floating IP and it will run a FreeSWITCH recovery process. The end user will only notice a dead air for quite some seconds after that conversations will continue normally. 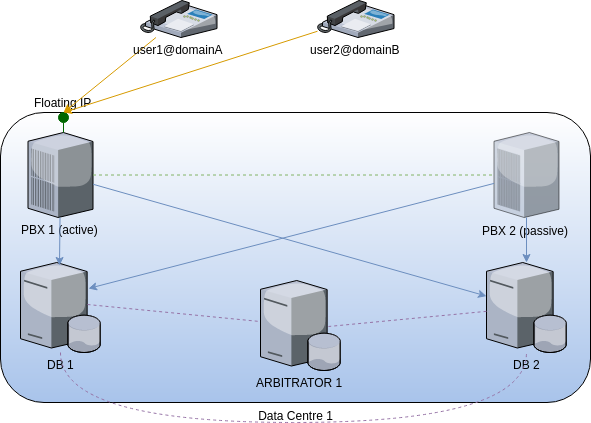 When the faulting server recovers, it has a new role as the passive node. The roles will switch when the actual active node fails. I hope this gives you a very clear picture of the way a high availability FusionPBX cluster works.